A few days ago I shared my new favorite Italian sauce, Classic Ragù Bolognese. I liked it plenty on just plain old spaghetti, but I think it really shines on gnocchi. And once you get the hang of the gnocchi dough, you’ll be serving it right and left. Few ingredients, little time, delicious results. What else can I tell you? When cool enough to handle, cut each potato in half and scoop out all the potato you can, leaving the peel. Put this in a mixing bowl. Using a ricer (if you have one) or a whisk (which I use), mash the potato until no lumps remain. Pour the riced potato on a clean counter and make a well in the center. Place the egg yolks in the well, along with the Parmesan cheese, a little salt and pepper, a little garlic powder, and the fresh (if you can) nutmeg. With your hand, mix the ingredients until everything is incorporated. Add the flour and mix as lightly as you can. If you need more than the 3/4 cup, add it a little at a time. You want to add as little flour as possible and avoid overworking the dough. When you have the right amount of flour, you should be able to roll the dough into 1/2" thick logs that will stay together. If your dough won't do this, add just a smidgeon more flour. Break off portions of dough, roll in 1/2" logs, and cut in 1/2" pieces. Dust each piece with a little flour and press onto the back of a fork to make little marks. This is purely so that sauce will get caught in those little grooves. But really ... they're so very tiny that if you feel like skipping this step, I'm pretty sure your sauce will still stick to the gnocchi. Still ... don't you want to try it just once? Set the gnocchi on a baking sheet lined with parchment paper or a silicone sheet. If you don't have those, spray the baking sheet with a little vegetable oil. 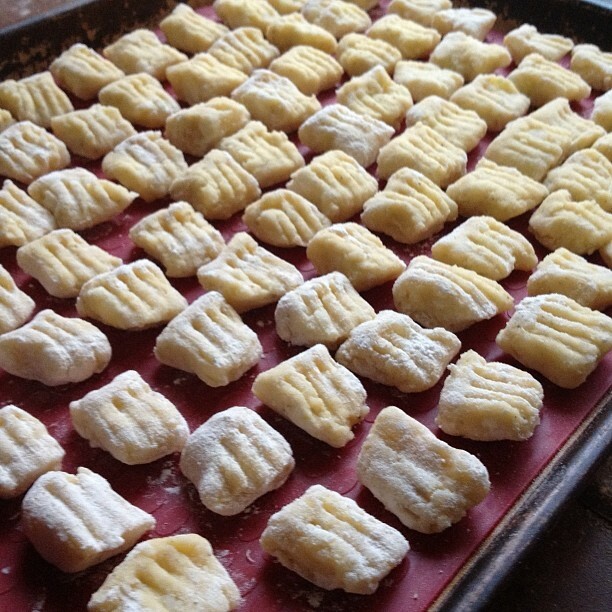 Let the gnocchi dry 20 minutes on one side, then turn and let the other side dry 20 minutes. If you're ready to cook the gnocchi now, boil a pot of water. Drop about 1/3 of your batch of gnocchi in the pot and watch for about a minute. (It won't take more than 90 seconds.) The second that the gnocchi rises to the top of the water, they're done. Remove with a slotted spoon and serve with your favorite sauce. *Note: If you can't serve the gnocchi on the same day, be sure to freeze them. They won't keep well in the fridge. Just put a sheet of gnocchi in the freezer, leave for a half an hour, and then place the frozen bits in a plastic baggie. This is a great recipe to make just after you’ve served baked potatoes and discovered three lone survivors. … and then use whatever fancy gadget you have to “rice” the potatoes. As much as I’d love to have a potato ricer, I don’t think I have the space to store it. My philosophy is this: if you’re a gadget and you want to live in my kitchen, you’d better be able to perform a whole bunch of tricks. Which my handy whisk does. When you drop the egg yolks in the well, be sure to snap the picture off to one side, because that just makes the whole thing more mysterious and intriguing. Here’s what it looks like before adding the flour. Just press these little pieces against the back of a fork. Or not. Let them rest a bit. Once they hit that boiling water, they’re going to need every bit of energy to boing themselves from the bottom of the pot to the top. Have you ever tried gluten free flour with these? I haven’t, but I think it would work. You just don’t want to work the dough too much. Let me know how it works if you do try it!